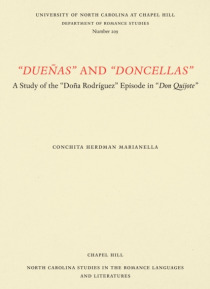 Conchita Herdman Marianella's book develops the words "e;Duena"e; and"e; Doncella"e; in their Cervantine context. The book offers the two sides of this character type in pre-Cervantine usage, from the tendency of the duena or doncella to appear as a lady-in-waiting, damsel in distress, or other high-level intermediary and to behave in patterns commensurate with that socio-cultural … status, to the stereotyped, irate, scheming, gossiping chaperone. While Cervantes often uses this second type in other prose works, the relationship between the two semantic fields becomes much more complex in the Quijote, so explicitly constructed as a satire of the earlier style. It is this tangle of character type and history that Marianella unwinds. This analysis newly illuminates the episode of Dona Rodriguez, one of the pinnacles of the creative craft of the Quijote.